Here are four great ways to get in the holiday spirit in Charlotte. The holidays are always a great time to spend a little extra time with family and friends, and there’s no better way to spend some quality time together than sharing a new experience. Luckily, there are plenty of holiday-centric activities to choose from in Charlotte for active adults who want to get into the Christmas spirit—including elaborate light displays, Christmas villages, and more. See Charlotte’s favorite amusement park transform into a winter wonderland at Carowinds’ annual Winterfest. Holiday festivities take place on select nights now through December 31 and offer fun for all ages. Bring the whole family to experience over 5 million sparkling lights, elaborate Christmas displays, and the festival’s centerpiece—a 70-foot tree. Along with the holiday decor, guests can enjoy live performances, hands-on activities, and specialty desserts and holiday dishes. As an added bonus, more than 20 rides will be open during WinterFest. Tickets start at $26. Complete your Christmas shopping this year at Uptown Charlotte’s very own European-inspired Christmas Village. Shoppers can peruse through holiday merchandise from all sorts of local vendors at the village every Tuesday through Sunday from Thanksgiving day to Christmas Eve. Santa will be on site every Saturday and Sunday, providing the perfect opportunity to get a special holiday photo with the grandkids. Additionally, there will be a village bakery serving sweet treats like Austrian strudels, as well as mulled ciders and wine. 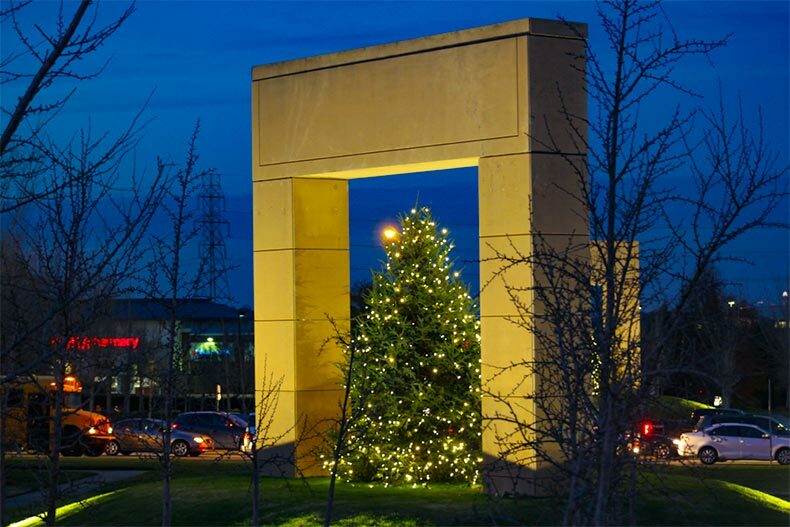 Get into the Christmas spirit at the Daniel Stowe Botanical Garden, located less than 30 minutes outside of Uptown Charlotte. Every year the garden is completely taken over with a million twinkle lights, a musically-orchestrated topiary display, and an orchid tree. There will also be live music, holiday shopping, and model train displays to admire. Grandchildren will especially enjoy the garden’s Children’s Discovery Trail, which features a variety of activities specifically geared toward kids of all ages. Santa and Mrs. Claus will also be in attendance on select nights for professional photos. Holidays at the Garden runs through January 6. Tickets start at $7.95 for children and $12.95 for adults. One of NASCAR’s most famous tracks is turned into one of the city’s most impressive Christmas light displays during Speedway Christmas that takes place now through December 31. Charlotte Motor Speedway will be decked out with 3.5 million lights that stretch over a 3.75-mile course that visitors will drive through. Every Thursday through Sunday the Speedway Christmas Village will be open. The village features a 50-foot Ferris wheel, Bethlehem village, plenty of food and drinks vendors, as well as an opportunity to take photos with Santa. On certain nights the speedway’s giant TV will screen Christmas-themed films the whole family can enjoy. Tickets start at $20 per car with a maximum of 10 people. Express passes that will allow guests to bypass the long lines to drive the course are available for an additional $20.